Robert Harris on Air Power, Munich, and Chamberlain's "Finest Hour"
The specific claim about aircraft is valid, according to an authoritative article, “From Peace to War: Royal Air Force Rearmament Programme, 1934-1940,” by Martin Waligorsk on Spitfire.com. The RAF, Waligorsk writes, went from about 250 aircraft (fighters and bombers) in first quarter 1938 to about 2500 by third quarter 1940. (The downturn in the fourth quarter probably represents losses in the Battle of Britain.) By this measurement, Britain indeed had ten times as many aircraft in summer 1940 than in January-March 1938. We must be mindful however that the Luftwaffe was not standing still. According to Professor Carroll Quiqley, writing over half a century ago, at the time of Munich the Anglo-French and Germans each had about 1000 military aircraft. By 1940, Britain had a slight qualitative advantage. Of course, the question is not who had more aircraft, but how they used them. William Shirer, in his classic, The Collapse of the Third Republic, says one of the big unanswered questions during the fall of France was what happened to the French air force. Britain’s primary contribution to a Czech campaign in 1938 would not have been its air force but its navy. Churchill wrote: “…it did not take much thought” to know the Navy “could not be deployed on the Bohemian mountain front.” But it could enforce a serious blockade of Germany. Before the Munich agreement, on 27 September 1940, the Admiralty ordered mobilization of the Fleet. Hitler told Goering, “the English fleet might shoot after all,” and postponed German mobilization. Although British attitudes were hardening by 1938, Chamberlain reflected the perceived wishes of his countrymen. Where he was wrong was refusing to accept that their wishes were no part of reality, and failing to lead them to the truth. Nonetheless, without the rearmament programs he started, Churchill would not have won the Battle of Britain. That will always stand to Mr. Chamberlain’s credit. We should acknowledge this. One must ask: what principle was rooted? How can there be no virtue in the Munich deal, if it served the cause of the virtuous? Sir Max says Harris’ “key point” is that “in Hitler’s mind the Sudetenland offered the best justification for a war that he would ever have—incomparably better than his contemptible pretext for invading Poland a year later.” But it made no difference which pretext was better. What mattered was whether Hitler would have done so well if the British, French and Czechs had resisted. Harris omits this consideration. …in consequence of Wehrmacht demands and unlimited construction on the West Wall, so tense a situation in the economic sector occurred (coal, supplies for industries, harvest of potatoes and turnips, food supplies) that the continuation of the tension past October 10 would have made a catastrophe inevitable. Churchill steadfastly maintained that 1938, not 1939, was the time to take a stand. Aside from the moral issues, he pointed to what he saw as Munich’s greatest penalty. 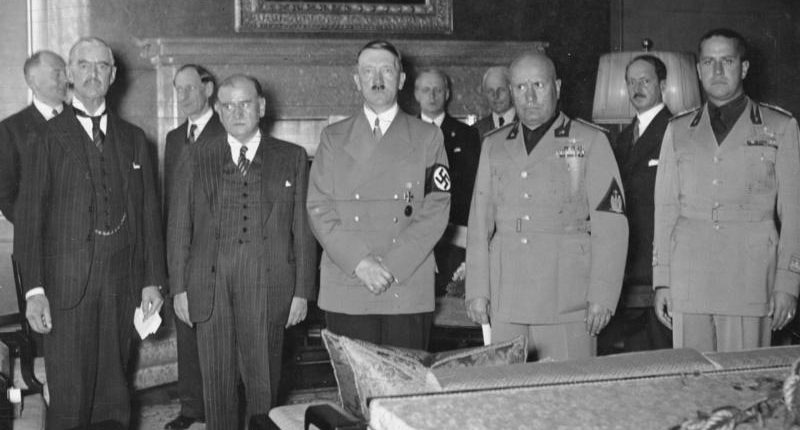 In August 1939, the German-Soviet non-aggression pact neutralized Germany’s leading potential military threat. That is something Mr. Chamberlain’s defenders rarely mention. Why the Western world—which was aware of the classical lessons and geography of war and was still suffering from the immediate trauma of the First World War—chose to tear itself apart in 1939 is a story not so much of accidents, miscalculations and overreactions (although there were plenty of those, to be sure), as of the carefully considered decisions to ignore, appease, or collaborate with Adolf Hitler’s Nazi Germany, by nations that had the resources and knowledge, but not the willpower, to do otherwise. the world will get along much better when modern Western leaders accept the necessity of cutting deals with Russia’s thuggish President Putin and China’s brutal President Xi. But we need to recognize that there is no chance of persuading such people to keep their word or respect our vital interests, unless we possess the armed forced to defend them by force, if necessary. That was the lesson Churchill drew too.